Follow These Tips to Lower Your Heating Bills! Looking for ways to save money on your heating bills this winter? Almost half of all the energy your home consumes goes toward your heating and cooling system. Although you are already doing some things to watch your energy usage, there are many things you might be forgetting to do. Another clipper weather system is whipping across the Midwest this week, bringing with it some colder weather and some possible snow. This means increased use of your heating system and higher energy bills from staying indoors. About 30% of your home’s total energy usage goes toward heating, while only about 20% is spent on cooling. 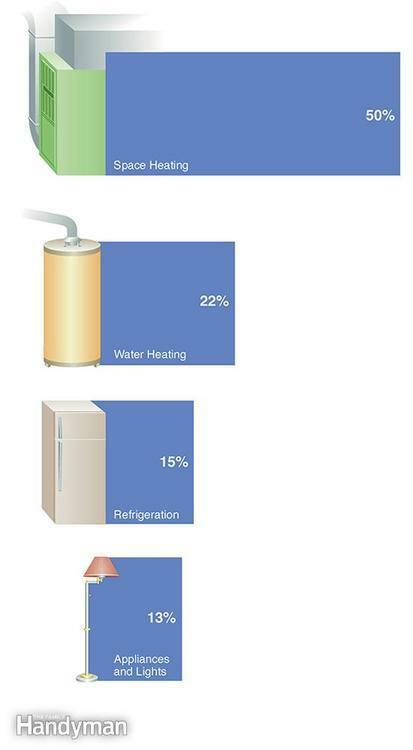 In addition, the second highest consumer of energy in your home is your hot water heater at 22%. Like any machine, your heating system needs to be regularly tuned and inspected (about once a year, usually before the winter season). This will diminish repairs by up to 95% and can double the life your heating system. You will save money in the long run by preventing expensive repairs and in the short run by raising efficiency and lowering monthly heating bills by up to 25%. Call Gold Medal Service for your heating and cooling tune-ups. For a full list of services, a Gold Medal maintenance visit entails, visit our heating maintenance page. With our membership plan, you won’t have to remember to get your HVAC system checked and tuned; we’ll call you! Dust, dirt, and debris that accumulate in your air filter impedes airflow and causes your heating system to work much harder than it needs to. Filters should be checked and/or changed every 30 days. Although the frequency of air filter changes depends on many different factors, including occupancy and size, filters are normally due for a change every 30-90 days (often closer to 30 days). You can tell if it needs to be changed if you can no longer see any light through it. For a how-to video showing you exactly how to change an air filter, watch this HowCast video. Breathe a little easier and save money on pricey repairs down the road by remembering to check your air filter every month! The standard temperature setting on many hot water heaters is 140 degrees; however, if you set the temperature to a more moderate 120 degrees, you will save money and eliminate risks of hot water burns. Most water heater dials don’t have temperature marks, which is why you might have to do a little testing with a thermometer. Set the dial to its warm setting, let the hot water run for about 3 minutes, and then fill up a glass of hot water and measure its temperature with a thermometer. Remember to mark your water heater dial so you can remember next time. You can also save money on your water heater costs by insulating the hot water pipes with some foam insulation. They are extremely cheap to purchase and super simple to put on. Simply cut to the desired length, slip it on, and duct tape the seams of any extra insulation that you need. Also, consider insulating the hot water heater itself. This is a bit more complicated, though, so make sure you follow all of the instructions and avoid blocking any essential openings. In April 2015, new water heater regulations will make replacing your water heater a lot more expensive. If your water heater is older than 10 years old and/or you are considering replacement, do it before April to avoid having to spend more money on new, expensive equipment. If you install or replace your water heater now, you will still meet the new requirements and end up saving money on what’s currently on the market. The new water heater will be good for at least another 10 years. Talk to a Gold Medal Service representative about what your options are for high-efficiency water heaters, including tankless designs, that meet your budget. For every 1 degree you lower your thermostat, you are saving 2-3% on your heating bill. For cold weather months, 68 degrees is a good temperature setting, but don’t worry about turning it up a bit if you can’t take it. We have blankets, sweaters, gloves, hats, and fuzzy socks for a reason. Bundle up when you are inside to avoid blasting the heat. If you have further questions about how to save money on heating bills or how the U.S. Department of Energy’s new water heater regulations will affect you, give us a call. We’ll be glad to answer any of your questions! To schedule heating maintenance/repair or installation, contact the professionals at Gold Medal Service. We’ll be there with our same day service guarantee to fix your hot water heater.